YOUR LIFE IS WORTH LESS THAN 10 CENTS! "I couldn't breathe, nor can the young Kurdish women of today. The internet has only made things worse, because now they see the possibilities in the outside world. They have no freedom themselves. And without that they can't live. Mizgin looks at her husband and fellow musician, Anders Honoré, her eyes red and her voice shaking. ”That society needs to change, and I will write songs to put those problems on the agenda”, she says. The Kurdish singer knows what she is talking about. Today she feels bad that she is living happily with her husband and child, enjoying music and unlimited freedom in Denmark, whilst her Kurdish sisters are still, in 2012, giving birth to their children outdoors during a break from field labour. That is how she is, Mizgin. As a human being, singer, composer and musician playing her saz. Her heart is big, and her emotions are strong. But the story about the Kurdish women is also her story. At the tender age of two, Mizgin contracted polio. She could not go to school as the road was unpaved. So while others learned to read and write, Mizgin sat at home and dreamt herself away, listening to radio and music. No woman played an instrument, it was a cultural thing. So when her older brother bought a saz, a three-stringed Turkish instrument, she taught herself to play in secret. She was 16 then. Two years later, she had had enough of living a restricted life in isolation, with bans and prospects as dark as her long hair. Against her parents' will, she moved in with her sister in Istanbul. Here Mizgin learned to read and write. She was still at the bottom of the hierarchy, being a country girl and a disabled person, which in Turkey is seen as a sign that you cannot take care of yourself. And her Turkish was far from perfect. But Mizgin did not give in. Her answer to the situation was to practise even more, and she started to play with other people at a local community centre. Her efforts were rewarded. Two years later, in 1994 she signed a contract on an MC release. A new female Kurdish voice was born. This was something entirely new and the cassette sold 100.000 copies. Many people bought a poster with Mizgin dressed in a traditional Kurdish gown and stuck it on their wall. The publisher took the money, and Mizgin became a familiar face to the police who often saw her face on posters while searching Kurdish homes. Her eyes change colour again. Mizgin was, she says, ”just a young sensitive girl with a good heart and mind, who enjoyed playing and singing.” Now she was caught up in politics. It pained her. She had to move on, get away. This time she wanted away for real, to the west. Through connections she managed to obtain a ten-day visa to Denmark and a bank loan for the flight ticket. She knew absolutely nothing about Denmark, and there she was, standing all alone in Copenhagen Airport. Nevertheless, for the first time she felt free, independent and grown up. Three days later she applied for permanent residence at the Sandholm Refugee Camp. ”They treated me well and gave me a little to eat and a room. At Sandholm and later at Kongelunden I met people from all over the world, and I learnt some language. 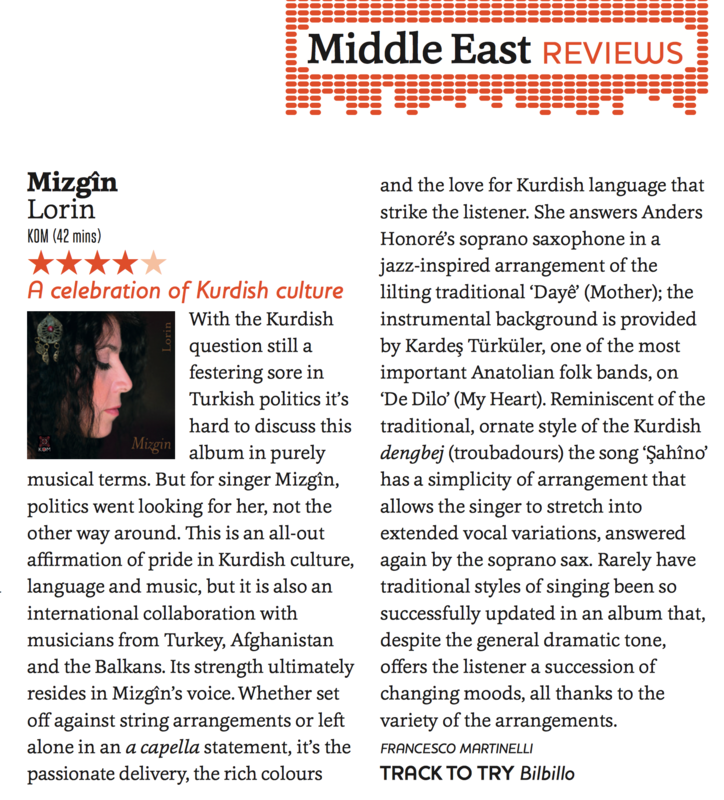 It was my university and it gave me the the opportunity to find my way into my music, that now has elements of my Kurdish heritage and recent Western influences that can be heard on my new album ”Mizgin”, she proudly explains. In Denmark, Mizgin is becoming a role model for many young women with a Middle Eastern background. ”I often meet young women who have a hard time finding themselves between two cultures. What can be done to help them?”, Mizgin asks, and she continues to look for the answer in the one thing that has led her through a life-long struggle for freedom: Music. Mizgin was born in the high plain of River Tigris in East Turkey, in the city of Batman. At the age of two she contracted polio in her legs. This became a decisive moment in her life, and destiny had more to come.